I am back at Mountain Sky and living it up. The past two weekends the skeleton ranch staff have gone hiking the foothills around here in search of sheds—antlers if you will. 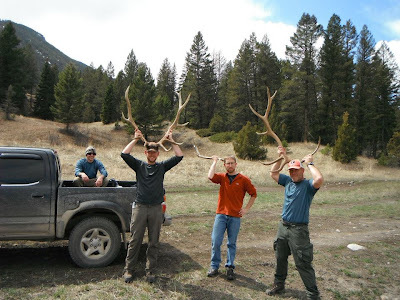 The resident elk, whitetail deer, mule deer, and occasional moose are nice enough to leave their antlers they grew for the previous fall in the surrounding hills, and so we find it our duty to go out in search of these beautiful treasures. Two weeks ago I found a nice 4-point elk shed with a drop tine—one that for some odd reason curves down instead of up—along with a single point elk ‘spike’ this past weekend. Yesterday I found an old 2-point mule deer horn (and the other guys I was with spotted a grizz-sweet). Everyone out here has a couple of sheds laying around, so now I fit in. My 4-point currently adorns my desk. On our hikes we have also seen a lot of grouse, flushing them out of the grass as we walk. I will be honest, a lot of the time they scare the crap out of me as my mind is intently focused on scanning the ground for sheds when a grouse bolts from ten feet away without warning. They have also been doing mating displays, which are pretty cool to watch. You can see below the brilliant red patch on this one’s neck. In other news, the mild winter left very little snowpack on the mountains, so this weekend we are tentatively planning on tackling a nearby peak, Ramshorn. This is absurd, considering that last year it took until the very end of June for the snow to recede enough to climb any peaks around here. Let the climbing season begin!